The documents that remind Andrea Giorgio can be seen in the City Hall of Altamura (Piazza Municipio 1). 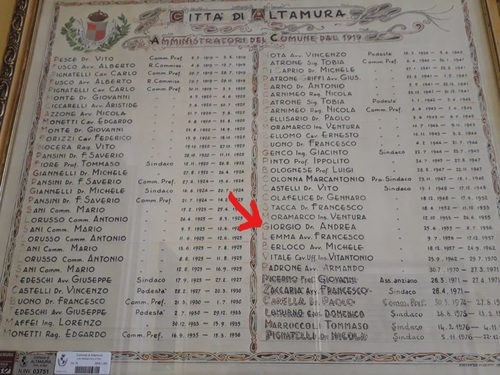 This picture shows the list of Altamura's mayors, among which is mentioned Andrea Giorgio. Andrea Giorgio was the mayor of the city for more than a year, between 1956 and 1957. Because of the massive snowfall he had to manage, he is remembered as the "Mayor of the snow"1. 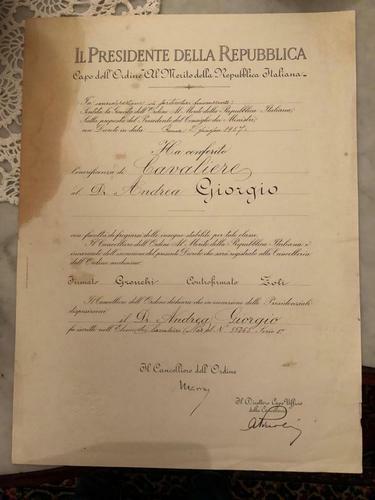 For his merits and his civil commitment, he received the honor of Knight2 from the Italian President of the Republic.